A very interesting document in the Conolly papers in PRONI contains a list of tenants who proposed to emigrate to New England in 1718 and who had disposed of their lands before emigrating (also lists the new tenants on the lands). What is interesting here is that John Hamilton left for America and his wife Allison is listed as the new tenant. 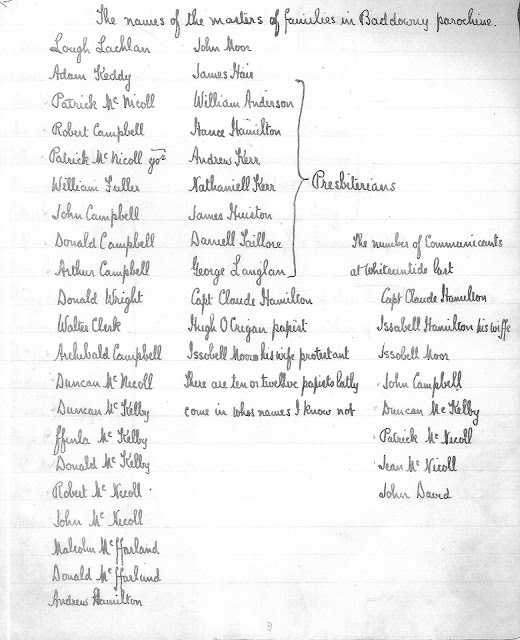 John Hamilton is listed in the 1740 protestant householders' returns for Mulkeeragh in the parish of Tamlaght Finlagan so it is entirely possible that John returned to Ireland. Married John Hamilton in Ballykelly cong(regation) & Jean Miller in ye parish of Desert and allowed benefit of proclamation in ordeur to marriage 5 July 1710 (note Desert probably refers to Desertoghill parish). We have no way of knowing if these Hamiltons were related to those in Mulkeeragh but it does show the preponderance of the surname in the Ballykelly area in the early 18th century. Hamilton is of course a common name in Ulster. There is then a long gap in the records as the next reference is found in the 1831 census returns when we find a William Hamilton resident in Mulkeeragh. No 2. William Hamilton one family present 6 males 2 females in total 8 all Presbyterian. 1822 Nov 25th Anne dau of William Hamilton & Jane Little his wife near Sheephill (page 122). Sheephill is the English translation of Mulkeeragh. The family of William Hamilton appears to have disappeared from Mulkeeragh by the time of Griffiths Valuation (1858). Evidence suggests that they may have moved to Drumreighland. Where does Samuel Hamilton the great grandfather of Steinbeck fit into this picture? No John Hamilton was recorded in Mulkeeragh in 1831. There was of course a William Hamilton in Mulkeeragh 1831 who fits the profile as a brother (or cousin) of John Hamilton. So it seems likely that Samuel Hamilton baptised 1830 in Ballykelly Presbyterian was actually born in Ballykelly rather than Mulkeeragh. When Steinbeck visited Mulkeeragh in 1958 he was armed with some important family tradition. (In the 1920's one) of my uncles made the trip (Joseph Hamilton of Chicago). He reported that he had wept out of pure sentiment the whole time. He also reported that the family was just about played out; there remained two sisters and a brother—Katherine, Elizabeth and Thomas —children of my grandfather's brother, all old and all unmarried. They lived in the "new house" (the old house had burned down several hundred years ago). Steinbeck mentions 'children of my grandfather's brother' - this refers to William John Hamilton. Here is perhaps confirmation that Steinbeck's maternal grandfather Samuel Hamilton was educated in Ballykelly School in 1835. His older brother William John Hamilton had entered the same school in 1830. In 1858 William John Hamilton married Jane Ritche of nearby Tully. At Ballykelly on 25th November by the Rev. T.Y. Killen, Mr. William John Hamilton of Mulkeragh to Jane, second daughter of the late Mr. William Ritchie, Tully, near Newtownlimavady. Some tantalising clues are contained in the naming patterns - since Clark & Scott families also resided in Mulkeeragh this most likely indicates maternal and paternal connections to these families. It has been stated that Samuel Hamilton born c.1830 was son of John Hamilton by Esther Clark. Possibly this is oral tradition as the Ballykelly registers only name the father in the records before the 1840s. The fact that William John Hamilton gave two of his children the Clark name is suggestive in itself. Also interesting is the name Scott as mentioned Scotts were also in Mulkeeragh. 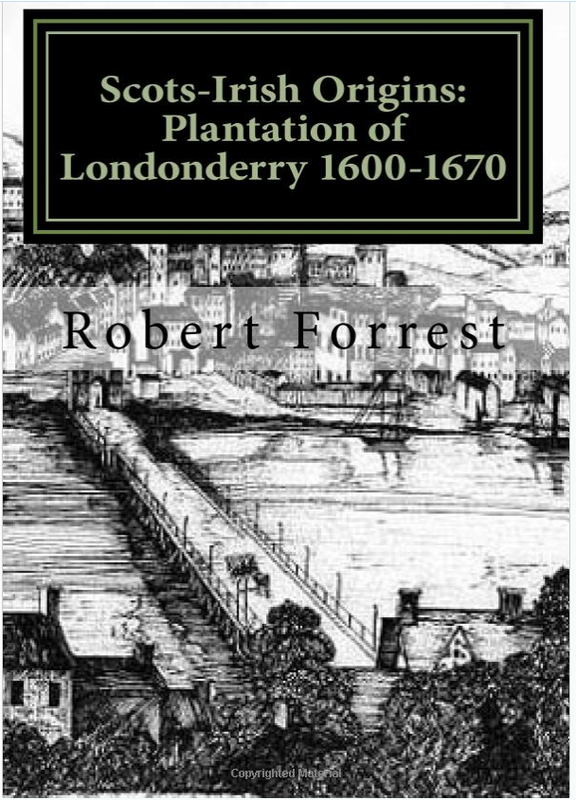 The surname Latta has a resonance in Donegal particularly Taughboyne area but I have also noted the surname Lattin in the Roe Valley of which Latta may be a corruption. We have to explain then how William John Hamilton came to reside on a farm in Mulkeeragh when his family were resident in Ballykelly in 1831 headed by his father John Hamilton. It will be noted that William John Hamilton's marriage certificate of 1858 indicates that both he and his father John were farmers. William John Hamilton is not listed in the Griffiths valuation (1858) for Mulkeeragh. Indeed the records fail to note the presence of any Hamilton farm in Mulkeeragh for a considerable period of time from 1794 to 1858. 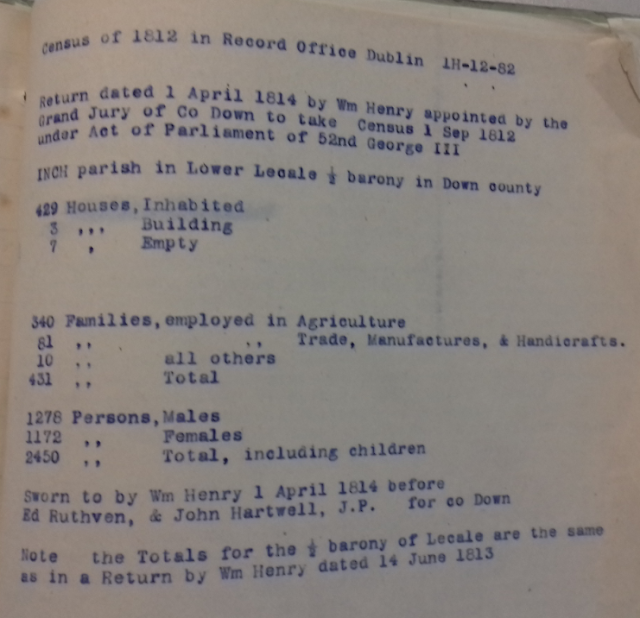 There are however, Clarkes and Scotts listed in the townland as farmers in this period. Perhaps, the family legend that the old Hamilton house burned down has some substance to it! No Hamilton was listed in the 1794 survey, tithes (1826), 1827 rentals or Griffiths valuation (1858) indicating that in the period 1794 through to 1858 that no Hamilton held a farm in Mulkeeragh. Will dated 27 April 1879 witnesses by John Limerick & Matthew Watt. William John Hamilton died in 1879 at the relatively young age of 55 (giving a lifespan of c1827-1879). He appears then to have been the older brother of Samuel Hamilton the emigrant (c1830-1904). A search of the Griffiths' revision books (PRONI online) indicates that William John Hamilton came into possession of a farm of some 45 acres before 1877 from William Scott (4a in the Griffiths books). Upon his death the farm passed to Thomas CJ Hamilton and then to Jane Hamilton his children. A headstone in Tamlaght Finlagan Church of Ireland graveyard (also contains Presbyterian burials) helps to solve the riddle of inheritance. In memory of William Scott/Mulkeeragh/who died 17 April 1875 aged 89 years/also his nephew William John Hamilton died 28 April 1879 aged 55 years/ and his son Alexander S Hamilton died 15 Nov 1861 aged 8 years/ also his son William S Hamilton died 4 Sept 1876 aged 9 years. Thus, William John Hamilton inherited the farm in Mulkeeragh from his uncle William Scott (c.1785-1875). The 1794 survey lists a William Scott in Mulkeeragh. A William Scott was listed in the tithes for Mulkeeragh 1826. In 1831 census No 7 Mulkeeragh William Scott was listed as head with 1 male and 1 female in family as well as 1 female servant total of 3 Presbyterians. That he had a servant indicates someone of above average means. This is confirmed in the 1831 field book which reveals his house and offices was valued at £6 and liable to rates. William Scott of Mulkeeeragh is listed as one of the highest cess payers in the Barony of Keenaght in 1843 (Derry Journal 24 Oct 1843). An interesting snippet from the Belfast Newsletter (19 Sept 1828) reporting on Keenaght Branch of the NW Society reveals that William Scott of Mulkeeragh was one of the more progressive farmers in the district. In the list of farming servant premiums for long and faithful service 1st premium went to Patrick McBride who has served Mr William Scott of Mulkeeragh for 37 years (that is from 1791 to 1828). This probably refers to William Scott senior. William Scott (c.1785-1875) who was William John Hamilton's uncle was probably son of William Scott senior. 1794 is the earliest reference I have been able to unearth of a Scott in Mulkeeragh. The Clarke family were of greater antiquity in the townland. 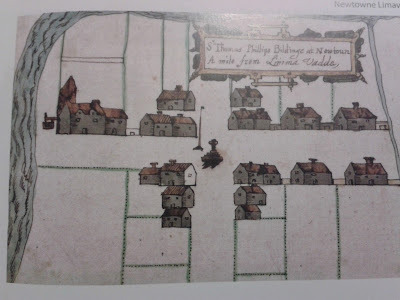 The late Julia E Mullin in her book the Presbytery of Limavady stated 'During siege times pewter plates belonging to the congregation were buried in the garden of the Hamiltons of Mulkeeragh' (p34). Further light is shed on this story in an article in the Northern Whig newspaper article dated 13 March 1928 (centenary celebrations of the building of the new church). 'The collection plates used at these services were loaned especially for the occasion. They are pewter plates with a history. They originally belonged to the Clarke family of Mulkeeragh and they were buried for safety in the garden there when the Earl of Antrim's 'Redshanks' were pillaging the country on their advance to the siege of Derry. Showing every evidence of antiquity, but remarkably well-preserved, the plates are now the property of the Hamilton family, Mulkeeragh, who are direct descendants of the original Clark family'. The 1740 Protestant householders' returns gives Hugh Clerk (sic) in Mulkeeragh. A Samuel Clark of Molkira (sic) had effects administered in 1794 (Derry Admin Bonds). Widow Clarke is listed in the 1794 McCausland survey alongside Samuel Clarke probably her son. Sacred to the memory of Samuel Clark junior departed this life 18 Aug 1837 aged 40 and of his parents Samuel & Martha Clark of Mulkeeragh. This is a rather rambling account of the Hamilton, Clark and Scott families in Mulkeeragh. We are constrained by the limits of the records but we can be fairly certain that Steinbeck had deep roots in the valley of the Roe. In the evening of his days Robert Hamilton is enjoying a relaxation from the busy cares of active life, making his home in San Jose, where he has lived for many years. A native of Ireland, he was born May 12, 1829, a son of John and Esther (Scott) Hamilton. When only a lad of fourteen years he came to New York City, and in Brooklyn he learned the trade of a painter, following it until 1853, when he came to California by way of Nicaragua, intent upon finding his fortune as so many thousands were doing----in the gold mines of the state. Unfortunately, he caught a fever on the passage out and his health failed in the new country, and he was obliged to return east. After his marriage there with Rebeca Gregory he came again to California, bringing her with him by way of the Isthmus of Panama. Locating in San Francisco he followed his trade there for four years, after which he mined for a short time, and then came to San Jose. Here he purchased five acres of land and erected a house between the city and cemetery, and engaged in farming operations. For about four years he engaged in sheep raising, purchasing three hundred sheep for $900, and in four years had a flock of one thousand. This would have brought him considerable financial returns had not the drought of 1874 caused him to lose heavily, when he disposed of his interests in this line and returned to painting. He had sold his ranch in 1870 and built the house where he now lives, and later built the two adjoining cottages, all this being very valuable property. In 1898 he retired from active labor, seeking a well-earned rest. He began life with nothing, but pluck and energy have brought him success, and he merits well the general respect and esteem in which he is held. Mr. Hamilton’s wife died in 1885, at the age of sixty-eight years. They were the parents of seven children, of whom two only are now living, namely: Mrs. Susie R. Igler, of Portland, Ore.; and Robert G., who is manager of the Swiss-Italian Colony Company, of San Francisco. In memory of his first years in the state Mr. Hamilton is a member of the Pioneer Society. Alex P. Murgotten, secretary of the Santa Clara County Society of California pioneers, conducted the simple funeral services society yesterday afternoon have 3:30 o’clock at the San Jose Undertaking company for the late Robert Hamilton, uncle Judge J. E. Richards of the appellate court. Mr. Hamilton died Friday of an illness due to his advanced years. He was 87 years of age. In 1853 he and his sister came to California via Nicaragua and they were again shipwrecked, both being rescued from the sinking vessel by means of rope. After this trip to California, they returned to New York, where he was married to Rebecca Gregory who return with him to San Francisco via Panama in 1858. They came to San Jose in 1865 and Mr. Hamilton purchased a small ranch in San Jose and the Cemetery on the Monterey Road. He followed his trade of painter here and accumulated a comfortable competence for his declining years. A brother, Samuel Hamilton, was a resident for many years of Salinas, where he died a few years ago. The family is well known and highly respected there. W. J. Martin, formerly manager for the Col wholesale house, is a son-in-law of Samuel Hamilton. Another son was George Hamilton, manager of Paso Robles flour mills, and Mrs. Olive Steinbeck of Salinas and Will Hamilton of King City were son and daughter. The pallbearers of the funeral yesterday were FB Kennedy, BW Borchers, A P Murgotten, LD Stephens, Simeon Baker and HA De Lacy.